Committee chairperson for the Federation, and State Rep.
meets this month with Soviet leader Mikhail Gorbachev. later this year in Iceland. tion recently at the Federation. speak for them,' she added. unable to book a similar ticket. rich in hope and courage. ped on it," Stein said. and that we're their only hope. key issue of East-West relations"
prepared this war. Jews got it onto our backs. Jews do not want it to end." leaflets reported directly to tile "IC/AO." hanged as a war criminal in 1947.
of the numbers," he said. thought to want to emigrate. will also be included. Envelopes and stamps are not supplied. Union the world's third largest Jewish community. to continue to insist that human rights remains a key issue of East-West relations. and religious rights in the Soviet Union. Commercial Blvd. & Cypress Creek Rd. Federation and its local constituent agencies and to meet their Jewish neighbors. sad a good time was had by all. Ernst every Tuesday from Nov. 8 to Dec 16.
program will take place at the Emerald Hills Country Club on Oct. 23 at 5:15 p.m.
Jackie Rosen aad Esther Melnick. ing under the chairmanship of Dr.
that the choice of Dr. and Mrs.
speaker will be Ehud Olmert. 7 p.m. at the Federation Building. the success of this major event. Development, Sea Fair, All day. Division Costume Ball, Sea Fair. Nov. 1-2 Hollywood Fun and Sun Festival. * To be held in private residence. the recent Shalom event are seen dancing ap a storm. produced by the Jewiah Federation of South Broward. tion of the Palestinian Arabs. "But look what has happened,"
Israeli control of the territories. 3. Who else to turn to? left Judaism for "Jews for Jesus"
pact on this alienated Jew. grateful that Chabad is around. policies will be proven wrong. and periods of heightened tension. face of this new capability. tion before the next elections. forward to ...," Mordecai M.
of how they came to this country? as well as educational setting. the baton of Arturo Toscanini. a ride variety of issues. ing for a golden future. Mission to New York City on Nov.
Wednesday, Oct. 15. at 7:30 D.m. separate sessions, and one need not attend both. Lederman at the Federation, at 921-8810.
put their lives in danger. scheduled for Monday, Oct. 27 at Inverrary Country Club. Foundation of the U.S. began sponsoring the event in 1981. Menorah Gardens and Funeral Chapels. prizes and souvenirs including three Titleist golf balls per player. with the United States. Dr.
is oven toasted So every flake is crispy, golden and delicious. Where keeping Kosher is a deidous tradition. and writing "A Certain People"
munity and the United States. stir Cover and cook for 2 hours over low heat, or until meat is tender. here at the recent Women's Financial Seminar. the Labor-Likud rotation of power agreement. ment immediately after the holidays. CONVENIENT SIZES FROM 10 ox. recently attended the Women's Financial Seminar. ters of conern to today's women. Bernhard. They will arrive on Oct.
the Nazis during World War II. Mayor Teddy Kollek of Jerusalem. So start a new tradition this Shabbos with Ronzoni? No pasta shapes up better. toZtt&^ttlZSXSSZSl ^ remainin9 P**8' **>** *"** and cheeses. the Hyatt Regency Hotel, Mr.
organization in the world today." determined to carry them out. 1984, it was reported by David B.
ficer of the Bond Organization.
. pet cigarette by FTC method. things going on in the community. be hosting a similar event. Dr. Jan Lederman at 921-8810. Michael and Merle Orlove's home. joined in the fun at the Orloves' parlor meeting. to go home ...tve can help. ny Marks and Nola Goldberg. From left kneeling, Sondra J. We can help you came home. to be dunked at the Family Picnic held recently at T.V. Park. "When L'Chaim Is Not To Life!" and Mint Chocolate Morsels by the addition ofl% milkfat. the traditional to the ultramodern. the ancient art of making shofars. 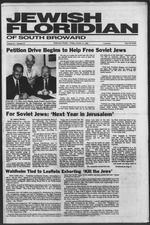 JFTV, the Miami Jewish Federation's television unit. "The World of Anne Frank." Returning to host the second year of the successful series is film. In Al Rooms ISMBMWi Daly Synopoguo Sentcet. Your Host. Ths Btrkowlz FamHy ft Alex SrnMow Astoc. and in the West Broward areas. munity Center in Ft. Lauderdale. State Hospital, and a Canoe trip. youth organization in the world. (flights from several other U.S.
My special congratulations to Dr.
ty MAZEL TOV on this occasion. between the people of the U.S.
and the people of Israel." and sustain Magen David Adorn. noon at Galahad Three, 3901 S.
p.m. refreshment will be served. posed by the students themselves. they're not going to come to us. our Jewish youth, who will? Saturday, Oct. 25, at 8 p.m. Conversation classes at 10 a.m.
and Shabbat Prayers at 11 am. ding on March 23, 1987.
these courses will be announced. "Jews in Arab Lands" at 7 p.m.
series of six delightful shows! resources to benefit Jewish education. Oct. 18 Services at 8:46 a.m.
24 Services at 8 a.m.
Oct. 26 Services at 8:46 am. and Minchah/Maariv at 6:30 p.m.
begin Friday, Oct. 24 at 8 p.m.
Wednesday, Oct. 29, 7:30 p.m.
1351 S. 14th Ave. Hollywood. Temple, 1351 S. 14th Ave.
the boat sails at noon. through since its embryonic stage. reached in the immediate future. 8:45 a.m. with Rabbi Presler. known office of publication: 8358 W.
Oakland Park Blvld. Fort Lauderdale Fla.
publishers: 120 N.E. 6 Street, Miami, Fla.
Miami. Fla. 38132. 7 Owner, Fred K.
Shochet. 120 N.E. 6 Street. Miami, Fla.
mortgages or other securities, if any: None. culation, given in this order: Average no. published nearest to filing date: A) total no. made by me above are correct and complete. s. Fred K. Shochet, publisher. vice for non-seatholder at 3 p.m.
lcude wfth Minchah at 5 p.m.
will officiate at all services. Tuesday evening at 8 p.m.
will not meet this week. Friday Evening (10/17) at 8 p.m.
will be held in the Sukkah. day. Services will begin at 9 a.m.
will take place at 8 p.m.
will take place Tuesday evening. Torah" from 8:15 to 9 p.m.
ing (10/23) at 8 p.m.
co-host a "Western Fun Night"
a.m. Mincha Services are at 4 p.m.
Thursday, Oct. 16, The Paul B.
vices begin at 8 p.m. Friday, Oct.
8:45 a.m., in the chapel. at 8:15 p.m., Friday Oct. 10.
p.m., Sunday evening Oct. 12.
a.m., Monday morning Oct. 13. 3:15 p.m., Monday, Oct. 13. Yizkor- Service begins 4:30 p.m.
graders in our Religious School. vice will begin at 10:30 a.m., Oct.
18. During this service Michael D.
Kappelman, son of Dr. and Mrs.
the Torah to become Bar Mitzvah. If you've shopped for funeral pre-arrangements. No entry or endowment fee. NOHTHHUtK Levitt Retirement Communities, Inc.